"At that time, when i went there, the ruins was a little bit dissapointing but sitting at the dike along the Amburayan river in the late afternoon was calming"
After coming from Bubon aso Falls at Sudipen, La Union, from the Bangar town plaza, I walked going north along the national highway towards the cemetery. I was informed at the Bangar Municipal Hall that it is located at the cemetery and probably it was demolished because they were building a memorial park but got to check it out if it is still there. 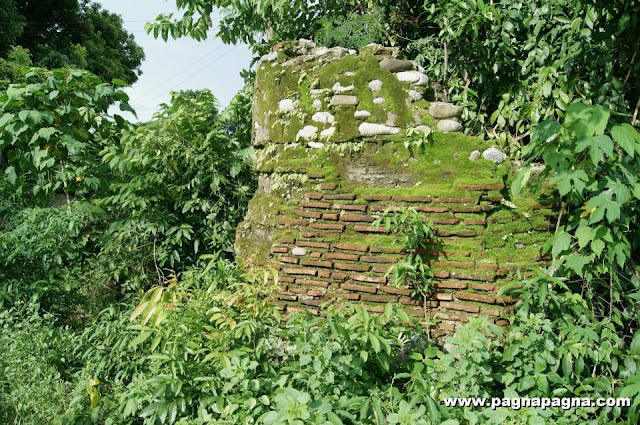 I was looking for the so-called "Timbongan ruins" which i saw at a paperback souvenir booklet of the 163rd La Union Foundation Anniversary dated March 02, 2013 wherein at page 52 (Bangar page) it showed an interesting spanish-type structure in ruins even though i do not know the history of it. I was at the cemetery and looked around. There was no ruins in sight. I chanced upon a tricycle and asked the driver. He knew where it was and we went to the site. It was a small structure on a more or less 5 meters by 5 meters square lot along the road at the back of the newly being built memorial cemetery which was now partially hidden in shrubs. What was disappointing was, near the fence were skeletal remains inside sacks probably from the demolished old cemetery. I did not lingered there too long and instead i went to to the riverside dike nearby. There i sat on top of the concrete dike and see the flowing Amburayan river across the vast wide open space. The Amburayan bridge connecting the province of La Union to Ilocos Sur can be seen at the far distance backdropped by the mountains of varying heights. 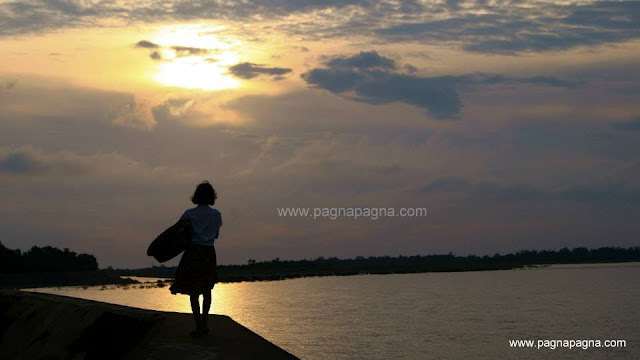 In front of me, across the river, was Tagudin, Ilocos Sur. I can also recognise one of the mountain peaks as Mt. Tenglawan of Bakun, Benguet beside it would be Mt. Kabunyan (hidden from view). Nearby, west of the dike where i sat, was the passenger bancas (local boats). They were transporting people to and from the outlying barangay (village) of Mindoro or just going to the farther side of the river. Some of the locals also went to the dikes to just relax and pass time. It was getting late in the afternoon and i called it a day. I went back to Bangar plaza and rode a bus back to Home Sweet Home.